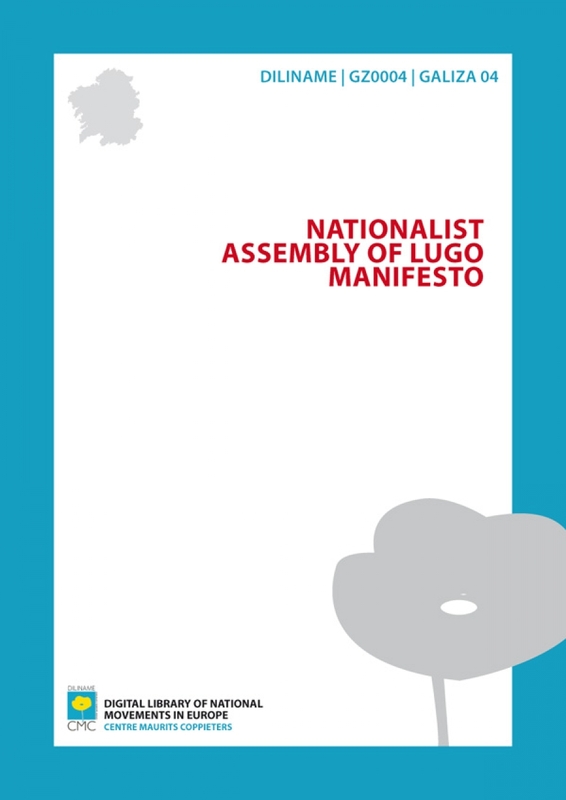 A foundational political manifesto for Galician nationalism demanding and structuring political and economic self-government for Galicia within the framework of a federation of Iberian nations. The slow progression of political Galician nationalism in the 19th and early 20th centuries took a decisive leap forward in 1916 with the appearance of the Irmandades da Fala (Brotherhood of the Language), which brought together regionalists from a variety of backgrounds. The consolidation of the Irmandades, which were explicitly defined as nationalist, took place at the 1st Nationalist Assembly of Lugo, which approved the Manifesto outlining the Galician nationalist movement’s political proposals. This foundational Manifesto owes its importance to its serving as the common basis for all nationalist programmes until the Second Republic. The Manifesto takes the form of a programmatic political document whose subject is the Galician people, addressed to the Head of the Spanish State. The document’s central demand is political, economic and financial autonomy for Galicia within the framework of a federation of Iberian nations, including Portugal. The Manifesto is divided into seven sections structuring the political and institutional framework of the federal state of Galicia, administrative reform, the powers of the Galician government, the legal framework, the economy and cultural, artistic and land management matters. The text recognises the legal personality of parishes, which are endowed with a management and government structure; establishes an electoral system based on proportional representation; demands co-official status for Galician and Castilian Spanish; recognises gender equality; dissolves the provincial councils; establishes an autonomous tax system; delegates certain powers, such as customs and excise, to the Federal State on the basis of a bilateral agreement; and highlights the need to draft a law to harmonise buildings with traditional local styles of construction. As Galicia has all the essential characteristics of nationality, we name ourselves, hereinafter, Galician nationalists, as the word regionalism does not gather all the aspirations and does not enclose the complete intensity of our problems. 2. Municipal autonomy, differentiating village municipality from that of neighbouring municipality, with the village Council establishing itself on the basis of recognising the parishes' legal status, which shall have their own Councils, elected by the heads of family (petrucios) men and women, according to their private assets. The president or heads of these Councils shall be the elected from the spokespeople or councillors of the municipal town council and shall elect amongst themselves a Mayor to run the Council. The parishes, with legal status, shall be able to manage and set up insurance and financial institutions for other neighbours and manage their common assets, which the Central Government, shall have to reinstate, thus having use of them. Therefore, the Council will have to be more than an administrative organisation, but a prolongation or complement of the parishes, like these are of the home, and will preside over the economic and social life of these. 5. In this federation, equality in relations with Portugal. 6. Believing in an accident-rate form of government we would like to make clear that we do not back it, but we sympathise of course with anything that supports a closer federal union with Portugal. 7. Entry of Iberian nationalities into the League of Nations. Elections will have to be the government's responsibility and must be protected by the Government. The elements that do not have a useful function for the group will not be eligible. The Assembly declares: If the Spanish Constitutional Court elections do not give us a specific guarantee that the people can vote with total freedom- which due to today's oligarchic organizations this would not be possible- we shall appeal to the representative of the Euskera and Catalan nationalities and if this is of no use, we shall appeal to the State further away from ours so that the League of Nations can defend our citizen's rights. 3. Completion of the Provincial Councils. 1. Naming of a Governing Council which shall have Executive Control, made up from a President, six councillors in charge of Departments of Administration, Law, Education, Public Works, Agriculture and Industry and Trade. 3. Social legislation, even in those cases where the social problems extend to the different nations of Iberia. 4. Tax regime, with no intervention from Central Government and to which the contributors will pay the Autonomous government what is established in the economic agreements. 5. The control of education by the present Government shall pass completely into Galician Control. 6. The banking regime which shall be controlled according to the social duty that the Bank's have today. This shall be the same for agricultural Credits. 8. Railways: Their nationalisation. Their legislation will be the duty of Central Government; their construction and administration will be by the Autonomous Government. 9. Duty free ports. The legislation and regulation of maritime traffic shall be managed by Central Government. 10. It is seen that with Peace standing armies will be abolished, and if only police remain, these shall also be under Galician Control and the numbers shall be fixed according to the level required to maintain internal order in Galicia. 2. Cancellation of Article V of the Civil Code and reform of the articles that refer to ab-intestato succession. 3. Publication of laws shall be done in the Galician language. 4. Equal married women's rights or at least in the case where the husband has emigrated. 5. The General Court of Justice shall be the last resort in Galicia and shall always be managed by Galician civil servants. 6. The working land of small landowners shall be considered a work instrument for reasons of embargo. 7. The tenant shall have the right to part of the increased value of the tenanted land, as long as the increase is due to his work. 1. Customs problems shall be resolved by agreement with the Central and Autonomous Government, except for the free exchange of cereals. 2. Reintegration of private property, such as State forests, towns and private land, in the easiest way possible. 3. Forceful forestry re-population. If private owners do not do so, the Galician Government could do so by charging an annual payment on the wealth created, or capital invested plus the interest. Reform of this point's civil legislation. 4. The Assembly declares that the tax problem on Galician land be resolved as quickly as possible. 5. Permanent landowner absenteeism shall also be considered a crime against Galicia. a. On urban and rural constructions, issuing a law that obliges the owners to adapt the style of their buildings to the general style of each Galician village. In the city of Lugo on the night of the eighteenth of St Martin's (September) 1918. [Come, Galician brothers, to our programme. It isn't and cannot be our final definitive word; but it is, as it goes without saying, a shout of anguish that calls you and is the only statement made about our Galician homeland. The time has come to raise our souls and thoughts to Galicia, and above all to its sovereignty, completely and without fuss. In this there is no argument: Galicia has a right, a fundamental right, to be the absolute owner of itself. With free will we shall create love marriages with other sovereignties, which our sovereignty will not want to agree with. Think then, about our conclusions, made for all Galicians. But also felt and practised. Our arms are open for fertile embraces. Together we will improve our great work. The ideal that enlightens us asks you to feel for Galicia, as if it was the most intense corner of your souls. Nobody is useless for this struggle. Our youth has a holy obligation with our homeland, and we wait, attracted by the immense fire of our love, so that every honourable Galician gives us their support for the Holy Cause of Redemption of the Mother Land. In the city of Lugo on the night of the eighteenth of St Martin's (November) 1918. A.Losada Diéguez; V.Risco; A.Noguerol; X.Quintanilla; M.Banet Fontenla; R.Cabanillas; A.R.Castelao; L.López Abente; V.Taibo; V.Parateha; A.Villar Ponte; J.Ferreira; L.Peña Novo; L.P.Carballa; X.Culebras; E.Bidegain; F.Vázquez Enríquez; G.Cedrón; F.M.Balboa; X.V.Viqueira; R.Blanco Torres; Rodríguez de Vicente; Ivo Fernández; Correa Calderón; R.Villar Ponte; L.Ares; A. Ramos; S.Mosteiro; X.Ares; X.Peña; L.Briones; Díaz Varela; P.Peña Novo; Sánchez Taíz; X.Faraldo; V.Veiga; C.Monasterio; X.Sarmento; L.de Labra; R.Oxea; C.García Colmelo; R.Gutiérrez; X.García Colmelo; F.Abelaira; A.Casal; T.Rodríguez; F.Zamora; V.Maceiras; A.Martínez; I.Rodríguez; X.Robles; R.Carballal; R.Areses; E.Charlón; M.Sánchez Hermida; T.Amador; M.Vázquez; B.Varela; I.A.Garaloces; X.Basteiro; E.Lence Santar, Guitián; V.Casas e X.Monteiro Mejuto. The Assembly that approved this manifest was attended by people of all Brotherhoods; present were 67 agricultural societies, five cultural centres; and five agricultural federations sent their support, together with eleven councils, as well as 49 associations and many important people of Galicia. (For those that sympathise with this manifesto, we ask them to communicate this as quickly as possible, to any Galician Brotherhood, to publicise Galician opinion).